Posted on October 3, 2018 at 2:01 pm. Neighbors Community Outreach Coordinator Kacie Bizot was named one of 46 “Credit Union Rock Stars” nationwide by Credit Union Magazine. She made the magazine’s 6th annual list for her outstanding efforts to uplift the Baton Rouge community through the Neighbors Capital Area Foundation. Kacie orchestrated the 2018 Clays For A Cause annual sporting clays tournament, which grossed the highest amount in the history of the event. Additionally, she took charge to raise money for the foundation through the Neighbors Employee Payroll Donation program. With these funds raised, the foundation will award $30,000 in scholarships to graduating students in the Baton Rouge area. Last year she coordinated giving out $15,000 in scholarships. Bizot was also recognized for her efforts coordinating the upcoming Neighbors Day. She worked with 13 charity organizations and schools to allow Neighbors’ 260 employees to volunteer more than a thousand hours of service. Accordingly, Baton Rouge Mayor-President Sharon Weston Broome has declared Monday, October 8th Neighbors Day. Here’s What Credit Union Magazine had to say! “When you work at an organization called Neighbors Federal Credit Union, it seems only natural that local community is top of mind. And it’s Kacie Bizot’s priority as the community outreach coordinator at the $834 million asset credit union in Baton Rouge, LA. 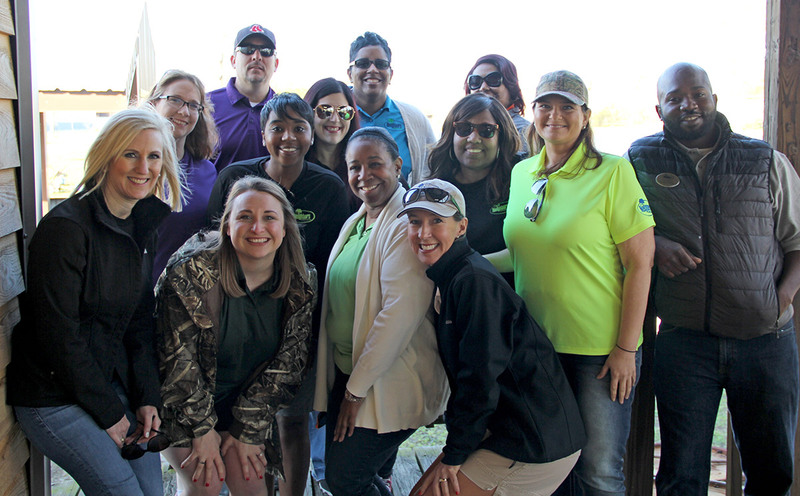 Kacie Bizot and other Neighbors FCU employees volunteer at Clays for a Cause, the credit union’s annual fundraiser. Bizot manages fundraising for the Neighbors Capital Area Foundation and grant giving to the community—along with the scholarship program, The Neighbors Way Tuition Assistance Award. She also coordinates all employee volunteer opportunities. Although new to the credit union industry (she started in December 2017), Bizot seems like a perfect fit. Bizot’s desire to help others started in childhood. Recently, Bizot led the Clays for a Cause event, a charity sporting clay tournament benefiting the Neighbors Way Tuition Assistance Fund. It was the highest-grossing tournament to date. In 2018, Neighbors awarded $15,000 in college scholarships to local graduating seniors. Thanks to the success of Clays for a Cause and the generous contributions from staff through the credit union’s Employee Payroll Donation Program, the credit union plans to award $30,000 in 2019. With her “awesome team members,” Bizot is always in the thick of planning the next event, such as Neighbors Day.